Is the Crown Crust Pizza inching ever so closely to the US? 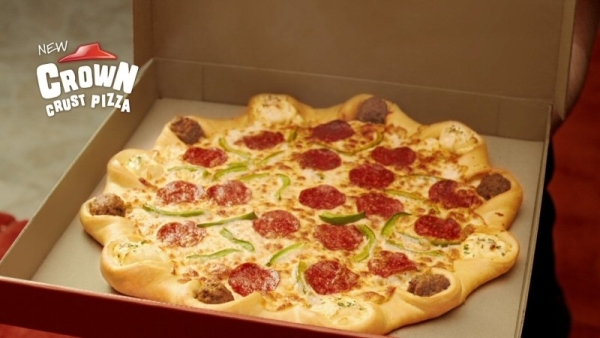 Pizza Hut Canada now offers the infamous Crown Crust Pizza, which features a flattened crown-shaped crust with pockets of meatballs and cheesy "gems" baked into the crust. The Crown Crust Pizza is available at Pizza Hut Canada for a limited time through April 14, 2013 and a large 2-topping Crown Crust Pizza is offered for $17.99 CAD (~$17.51 US). The pizza was first spotted last year in the Middle East, where it was offered with with cheeseburger patties or chicken filet nuggets as the "gems" in the crown crust. It was also offered in the UK last year and is currently offered in India with chicken and vegetarian options. Any chance we can build a wall at the Canadian boarder immediately? This is spreading like Contagion. That has to be better than the crap that the US Pizza Hut has put out recently. The sliders, the garlic bread pizza things. I regularly check the Pizza Hut Facebook, and people HATE the crap they have been putting out. People are more likely to comment on their Facebook when they're angry. Few people think "This is great! I GOTTA let them know!" It's always the angry ones. But you are right about Pizza Hut rolling out crap. Ownership isn't all they share with Taco Bell: They just keep reshaping the same old thing. The pizza rollers are the exception. Those are good (and free if you get the emailed coupon), but it's hard to screw up cheese, pepperoni and garlic butter bread.